Number 15 on this list — as it steadily builds to 100 reasons to believe the Earl of Oxford was “Shakespeare” — involves his prominent place in an anonymous work The Arte of English Poesie, published in 1589 and regarded as the central text of Elizabethan courtly politics. 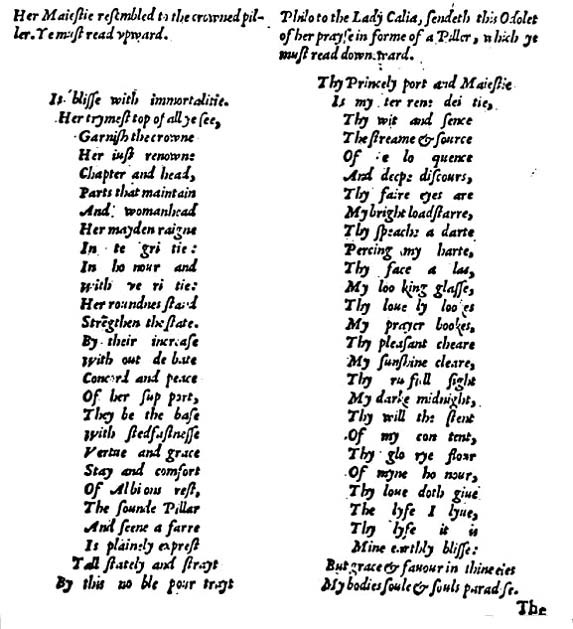 Now in 1589, three years later, The Arte of English Poesie by an unnamed author is published by Richard Field, who will soon issue Venus and Adonis of 1593 and Lucrece of 1594, both dedicated by “William Shakespeare” to Henry Wriothesley, third Earl of Southampton – the first and only times this previously unknown poet will dedicate any literary or dramatic work to anyone. Does Oxford head the above list because, as Webbe had announced in no uncertain language, he’s the best writer? Or is he listed first because of his nobleman’s rank? Our brethren on the Stratfordian side prefer the latter interpretation, and I won’t argue here except to note that the author surely knew he was putting a spotlight on Oxford’s literary work. 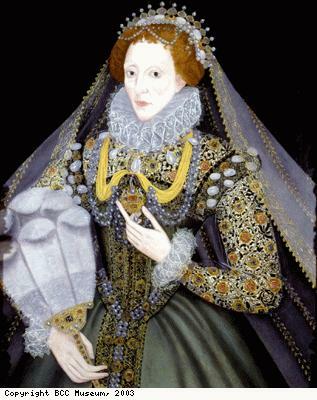 Edwards had been in charge of the Children of the Chapel from 1561 until he died in 1566, a period when Oxford [age eleven to sixteen] was studying with private tutors and receiving honorary degrees from Cambridge and Oxford. Edwards is credited with writing two plays: Damon and Pithias, the first English “tragical comedy,” set in the court of Dionysius and performed for Elizabeth’s court in 1565; and Palamon and Arcyte, a “lost” play based on Chaucer’s A Knight’s Tale [and regarded as a possible source for The Two Noble Kinsman attributed to Shakespeare and Fletcher], performed for the Queen at Oxford in 1566. I believe young Edward de Vere must have written, or at least co-written, those two plays credited to Richard Edwards. A decade later in 1576 several poems by Oxford [signed with his initials E.O.] 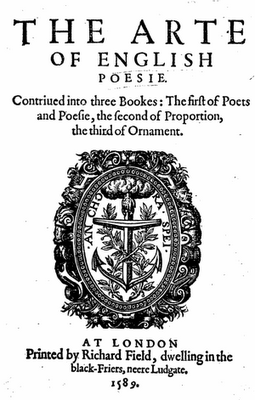 appeared in The Paradise of Dainty Devices, an anthology that claims Edwards had compiled it before his death in 1566 – in which case, if true, it’s possible that Oxford’s poems were written no later than his sixteenth year [although he surely could have added to them any time up to 1576, since the likelihood is that Oxford himself caused the anthology to be published]. The Paradise became hugely popular, going into ten editions over the next three decades. When wert thou born desire? By whom sweet boy wert thou begot? Tell me who was thy nurse? Fresh youth in sugared joy. What was thy meat and daily food? Sad sighes with great annoy. What hadst thou then to drink? What cradle wert thou rocked in? In hope devoid of fears. When such as saw her knew her not. In this same year of 1589 Richard Field would also publish the second edition of Ovid’s Metamorphoses, credited in 1567 to Oxford’s uncle Arthur Golding but more likely translated with youthful zest by the young earl himself. Here at the end of the tumultuous decade of the 1580’s, Oxford was about to leave public life and become something of a recluse. Now in 1589, was he using the press of Richard Field to make a final appearance as an identified poet? Was he withdrawing from the world while preparing to use the same publisher to reappear as “Shakespeare” just four years later, in 1593? Wit.- What (…) art thou? What is thy name? A man of great estimation in mine own country. We now that this Ipse, this Ver-y same (as in Sonnet 108), is, like Touchstone says in “As you like it,” what others writers do consent to be and what a very common figure of rethoric teaches the unlearned William: to have is to have, avere é avere. This chameleon condition is what gives the shadows of Gascoigne, Edwards, L.Vaux (in “Paradise…”), Lyly, Watson, Greene, Peele, Marlowe, Kyd, Spencer, Samuel Daniel and Shakespeare their substance. And many more, like that strange Arthur Bourcher of song 121 of “Paradise…,” edition 1585: “Vertue is the only meane…” This poem was anonymous in the 1580 edition, only identified in the 1585 one. This mysterious Bourcher (another Arthur, like Arthur Brooke) wrote an interesting introductory poem to Whitney’s “A choice of Emblems,” 1586. Whitney dedicated the emblem Avaritia huius saeculi to him. And it is a merry knight, a merry name, because Ford (Edward Oxen-ford) wrote “The Tragical History of Romeus and Juliet” in 1562 as Arthur Brooke, “ford” and “brook” meaning the same river of shallow water. What original stuff and keen insight! We cannot wait for your book. Thanks. My thanks to Hank Whittemore for mentioning my article. I hope Oxfordians will take a fresh look at The Arte. As both Hank and Ricardo Mena write, it’s an important part of Oxford’s story, whether or not we agree he was its author. I attended a seminar on this book at the Shakespeare Association of America meeting two years ago. Steve May admitted there are many puzzling features of the book, including the fact it never had a second printing, although it would have been expensive to produce (and he said publishers tended to make their profits on subsequent printings). Steve had just returned from research on Puttenham in England. I think it’s fair to say that nothing he turned up proves Puttenham’s authorship of The Arte. The seminar leaders were the editors of a wonderful 2007 edition of The Arte, Frank Whigham and Wayne Rebhorn. They were very tolerant of my paper (an early draft of the article that Hank cited), though they didn’t agree with me.